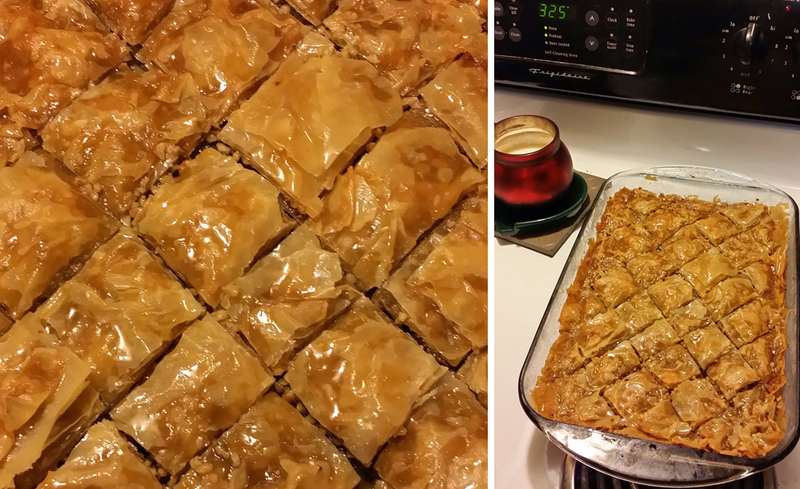 I just made Baklava for the first time! OR, you could just look at this beautiful visual straight from my very own kitchen! I used the Pioneer Woman recipe, because, after reading her book, I decided that she is a kindred spirit and that I just absolutely love her. Her recipe for Baklava is fairly simple and straightforward. The only thing I might change about the directions would be to melt the butter, or at least let it get very very soft, before putting it on the uncooked/layered Phyllo dough. If you don’t do this, the thin sheets of dough will tear. This might seem like common sense, but (embarrassingly enough) some of us could still use the directive. I might also put a flashing warning sign above the recipe regarding the RIDICULOUS amount of sugar/calories these bad-boys have . . . I mean, let’s just say that you wind up mixing butter and sugar with TWO CUPS of honey at one point. So, maybe don’t eat this if you’re diabetic. Health-factors aside, however, the Baklava was delicious and a smash hit with the crew who requested it! love your food/recipes/fun! My grandma would brush melted butter on each layer of phyllo dough, which means you are probably using a whole lb of butter! but it is full of yumness! !